$369.99€336.69£295.99AU$536.4942,179円5% off Out of Stock. 1.Digiprog III is the worldwide leader in the production and marketing of digital speed programming and correction software. 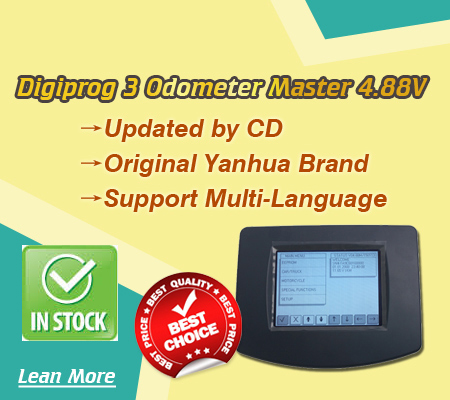 This Digiprog 3 Is Out Of Stock, We recommend you the best Quality Yanhua Digiprog 3. Note:Please do not connect the device to computer and do not try to update yourself ,or it may cause blue screen . 2. Language: Deutsch, English, Espanol, French, Portuguese, Italiano,Turkish, Nederlands. 4. With the use of the new DIGIPROG III, the odometer adjustment is a breeze. Intelligent accessories and extensive manuals are enclosed. Q1: Does Digiprog III change mileage for BMW after 2008year? Does Digiprog3 make key for BMW? A1: better use Digimaster 3 to program mileage for the high-end BMW. Digiprog3 can't make key for BMW, advice you use AK300 key pro. Q2: Does digiprog3 work with VW golf 6 2009, golf 5 2006 and Peugeot 407 2006? Q1: When I connect Digiprog3 with computer, I got error "DiagProg3.Setup GetByte_USB-TimeOut". A1: Only when you want to update Digiprog3, you can connect Digiprog3 with computer. At other times, don't connect Digiprog3 with computer. Q2: I download eeprom from digiprog3 v4.82 and store it in the computer, it fails to connect the software and the USB driver is successfully installed, but diprog3.exe found no hardware, it needs to store eeprom file, but the memory is full. A2: Sorry, digiprog v4.82 needs no connect with the computer, unless it needs to update. Q3: You say Digiprog3 can't connect with the computer, then what is the "setup.exe" used for? Where is the USB cable to be connected? How to supply power? After plug the OBD cable into the car, Digiprog 3 suggests insert No.1 cable, do I have to remove dashboard? A3: 1) Do not install the CD-ROM software "setup.exe". 2) When you want to update digiprog3, connect the USB cable to the computer. 3) It doesn't need power cord if the digiprog3 is directly connected to the car, the car will supply power for digiprog3. 4) After you plug the OBD cable (16pin cable), digiprog3 suggests you insert NO.1 cable, it means you have to use ST01 cable, not OBD cable. Q4: I found Digiprog 3 power supply is not 220V, does it matter? A4: Generally speaking, Chinese power input 110-220V, digiprog 3 power input 110-220V and power output 12V. Q1: How to select the language what I want. A1: Digiprog 3 DVD is German, but the operation is available with both English and German, after you turn on Digiprog 3, click "language" option to set. Q2: When use digiprog 3, I got disorder code, what can I do? A2: Please send us Digiprog III serial number, and we will send you program to refresh digiprog 3 main unit. Q3: With digiprog 3, how to convert KM to miles? A3: Our odometer programmers change the mileage value in KM, if your car mileage value is in miles unit and it becomes into KM unit after programmed, go to reset back in miles unit in the dashboard menu. Q4: what is Digiprog III power-on password? A4: Digiprog 3 Power-on password is 1. After enter password "1", click tick" √ "not " X", otherwise Digiprog3 will freeze. Q1: What is the difference between tacho pro 2008 and digiprog 3? A1: tacho pro 2008 and digiprog 3 share the same function. But tacho pro works with the car before 2006 year, digiprog 3 works with the car even up to 2012 year. Q2: Can I use Digiprog3 (item No.SM33) ST01 cable and ST04 cable to work with Yanhua brand Digiprog 3(item No.SM33-B)? A2: Yes, you can, but Yanhua brand Digiprog 3(item No.SM33-B) is better use this following adapter in the package, it works better and more stable. Q3: When I use Digiprog 3 (item No.SM33-B) to work with Honda and Toyota, it needs ST01 cable and ST04 cable, but Digiprog 3 doesn't contain these two cables. Q: When I use digiprog3 to program mileage for 2011 beetle and 2007 mariner, I got error "No connection", I use 16pin OBD cable. A: It means you can’t do via OBD way, you have to use the other way to do.